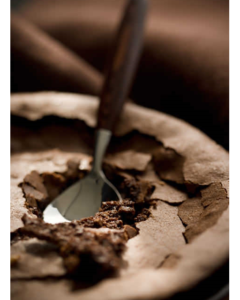 Wintertime is perfect for wrapping your hands around a warm mug of soup and sitting in front of a crackling fire. This soup is bright and sunny enough to lighten even the darkest winter day! 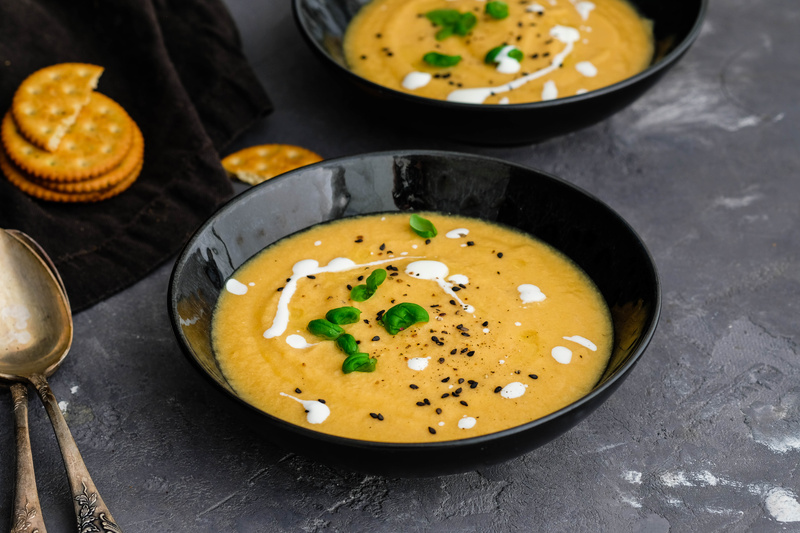 The spiciness of the ginger plays well off the natural sweetness of the carrots for a creamy and delicious soup. Sautee onion and ginger in butter until soft. Stir in the chicken broth and the carrots. Cover and cook over low heat about one hour or until the vegetables are very soft. Cool slightly and puree in batches in a blender or food processor. Return to a simmer and season with salt, pepper, nutmeg, and sugar. Stir in sour cream. Heat but do not allow to boil. Ladle into mugs or soup bowls and garnish each with a dollop of sour cream and a sprinkling of chives. Makes six servings. 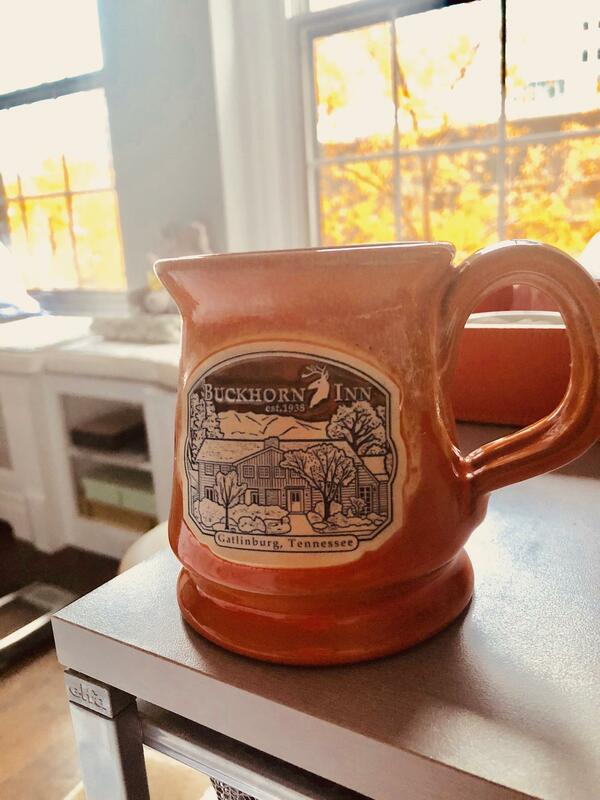 Our kitchen-door herb garden at Buckhorn Inn has provided us with the freshest basil, savory, cilantro, oregano, dill, marjoram, curry and others. 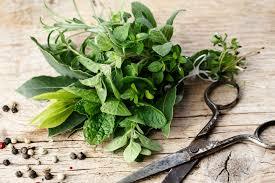 This profusion of tastes and aromas has inspired our kitchen staff to develop even more ways to use these herbs. What could add more flavor to a dish than a pat of herb butter? Simply mix softened butter with minced fresh herbs like chives, cilantro, tarragon or chervil and chill. Use with your next grilled meat or vegetables. Compound butters also are lovely on baked potatoes. Some combinations to try are dill with salmon, rosemary with steaks, oregano for bread—let your imagination go wild! A large sprig of rosemary can be used as a basting brush the next time you barbeque. The sprigs add an extra hint of flavor to the foods on the grill. You probably often use minced fresh herbs in your salad dressings. But why not roughly tear them and add them directly to the salad greens? Herbs like parsley and cilantro are perfect for this purpose. We serve this bright green sauce as a salad dressing or as a sauce over grilled salmon. Whisk the ingredients together. Makes about ¾ cup. Herbs like lavender, mint, basil and thyme are delicious in sparkling water, iced tea and lemonade. Dry your favorite herbs in the oven. Then mix with salt to provide lovely flavor when finishing a dish. Herb salt can even take popcorn to the next level! The same works with sugar. Mint sugar is perfect for sprinkling on fresh summer berries. Preheat oven to 350 F. Lightly butter 9 “ springform pan and dust with sugar, tapping out any excess. Combine chocolate, oil and ½ cup butter in a large heatproof bowl. Set over a saucepan of simmering water and heat, stirring often, until melted. Remove bowl from saucepan. Separate 4 eggs, placing whites and yolks in separate medium bowls. Add cocoa powder, vanilla, salt, ¼ cup sugar and remaining 2 eggs to bowl with yolks and whisk until mixture is smooth. Gradually whisk yolk mixture into chocolate mixture, blending well. Using an electric mixer on high speed, beat egg whites until frothy. With mixer running, gradually beat in ½ cup sugar; beat until firm peaks form. Gently fold egg whites into chocolate mixture in two additions. Scrape batter into prepared pan, smooth top and sprinkle with remaining 2 tablespoons sugar. Bake until top is puffed and starting to crack, 35 to 45 minutes. Transfer to a wire rack and let cake cool completely in pan. Cake will fall as it cools. Whip the topping ingredients until fluffy and pile on the cake. Did you know that according to culinary history the word “succotash” is derived from the Narragansett Indian word msickquatash meaning boiled corn kernels? 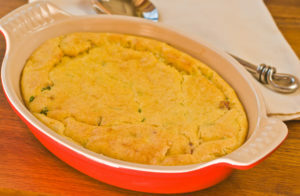 This simple and delicious dish featuring corn, beans and other vegetables is a nourishing dish of Native American origin. 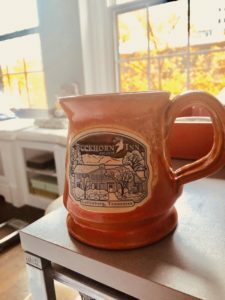 While we don’t know for sure what was on the menu at the first Thanksgiving, many food historians agree that a version of succotash likely was on the table. 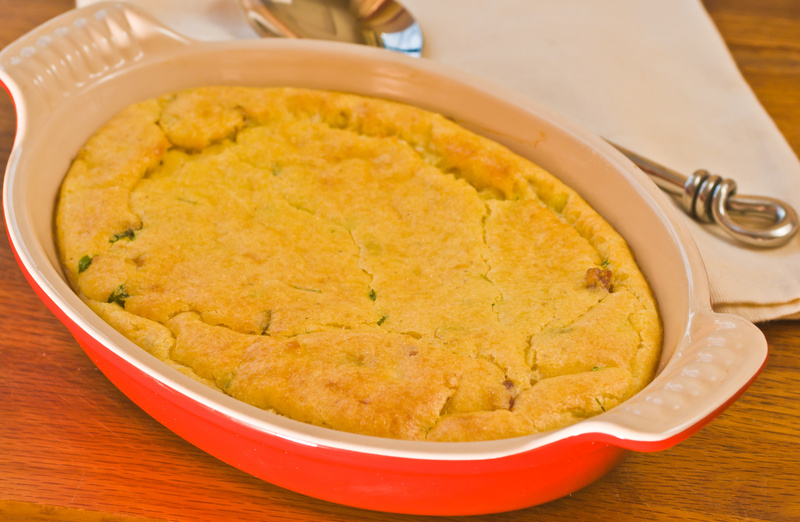 This dish has been adapted throughout the United States. Many versions have corn, pole or lima beans, green or red peppers, tomatoes, okra and fresh herbs. The ingredients are based on what is fresh and bountiful, so you are not likely to have exactly the same recipe twice. 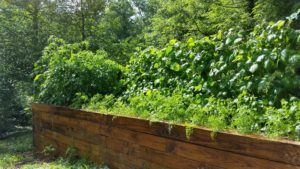 The majestic okra plants in the Buckhorn Inn garden beds are 10 feet tall! herbs. 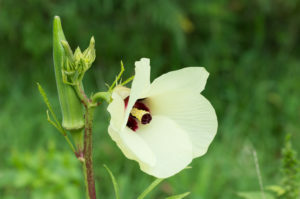 In the Buckhorn Inn garden we are growing Perkins Mammoth Long Pod okra from Burpee Seed Co. The 7″ long pods are tender and delicious. 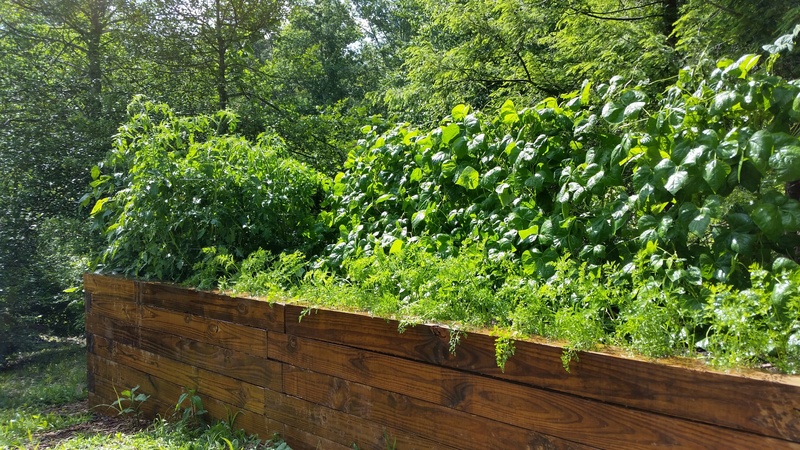 The towering 10′ tall plants are quite a sight in our raised garden beds! We are not certain what ingredients will inspire Chef Frank on Wednesday night, but here is an easy recipe that serves 6. It was adapted from a recipe on http://www.thespruceeats.com. Combine the okra and tomatoes in a large non-reactive saucepan. Add the salt and pepper and 1/2 cup water or vegetable broth. Cover the pot and bring to a boil. Reduce heat to low and simmer for 15 minutes. Add the beans and simmer for another 20 minutes. Add the corn kernels and cook for 20 minutes longer. Add the butter and blend. 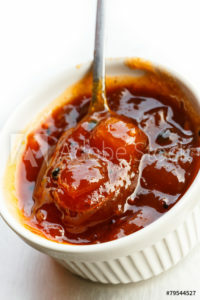 This makes a delicious hot side dish! Chef Bob Neisler is rightfully famous for his baked goods–and his cookies are no exception. When these cookies are in the oven, the delightful aroma has guests (and staff!) drooling with anticipation. They freeze well and are great to have on hand for a special treat. Tip: To easily measure out 1/2 cup of peanut butter, fill a glass measuring cup with water to the 1/2 cup mark. Add peanut butter until the level of water reaches one cup. Drain and use the peanut butter in your recipe. 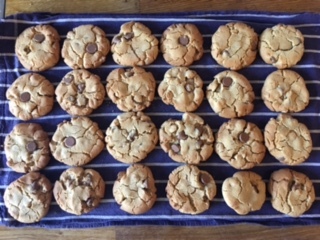 Chef Bob’s peanut butter cookies are irresistible warm from the oven. Put the oven rack in the middle of the oven and preheat to 350 F. Cover a 14″ by 16″ baking sheet with foil, shiny side up, and coat with vegetable spray. You may instead use a silicone liner. Sift together flour, baking soda, and baking powder. Cream butter, brown sugar, white sugar, and peanut butter. Add egg and mix thoroughly. Add sifted dry ingredients. Fold in peanut butter morsels and chocolate chips. Chill dough in refrigerator for one hour, or until firm enough to handle. With floured hands roll dough into 1″ diameter balls. Place balls on baking sheet two inches apart and flatten with the bottom of a glass dipped in flour. Bake for 12 minutes or until golden brown. Remove from cookie sheet and cool on a wire rack. Store between sheets of waxed or parchment paper in a covered tin. This recipe makes about 24 cookies. Note: These cookies also make delicious ice cream sandwiches. Spread softened vanilla ice cream on the bottom of one cookie and top with a second cookie. Roll the soft edges in chopped peanuts or chocolate sprinkles, and then freeze until firm.